I’ve taken some cues from the people around me that I respect. I try to emulate the best qualities I see and leave the rest behind. I consider Cliff to be an inspiration in many ways, but I never wanted to be the guy who you drop your guitar off with, and then find yourself wondering when it might get done. Overall, I’ve done pretty well with keeping a tidy schedule, and not making folks wait too long, but on occasion I’ve had the job that has dragged out over time, for various reasons. This particular instance I’m going to tell you about is the most extreme case of that, and not my proudest moment in shop history, but a valuable lesson that I’d like to share. In Spring 2007 I had just returned to Bellingham from guitar building and repair school down in Arizona. With a basket of fresh knowledge stuffed in my head but a limited amount of hands on experience, I was hungry to get guitars across my bench and start putting into practice some of these blossoming skills. Fortunately being an active musician in town, I knew lots of folks who were willing to trust a newbie, and give me a chance to level frets, pull off necks, fix cracks, and all manor of fun stuff like that. I wasn’t advertising “expert luthier services” or anything like that, but letting folks know that I was learning and working on instruments, and I would take my time, do my best to make sure everything was well tended to, and most importantly I wouldn’t mess anything up. Sort of like the luthier’s version of the Hippocratic Oath, I promised to do no harm to the guitar, and I wouldn’t take on a project I thought was over my head. So I thought. One of my earliest clients was Roger. He brought me his grandpa’s banjo which looked to be close to 100 years old and had a tear in the head. It needed a new skin and an overall set up. Being an old time musician myself who owns and plays banjos, this job was right in my wheelhouse. The repair went great and Roger was so pleased that he brought me another instrument that also had a torn head. It was something I was unfamiliar with but turned out to be a popular Japanese instrument called a Shamisen. Sort of like a square banjo with no frets and three strings, and it’s played with a big ice scraper looking pick called a Bachi. Roger had acquired it in Japan years ago, and as more of a sentimental wall hanger he was not really planning on playing it, but he wanted it fixed back to its proper state. “How difficult could this be?” I foolishly thought to myself. After all I was learning new things by the minute and doing pretty well with it all, and I was a bit proud of my work stretching a calf skin over a century old banjo. So I said I’d do it, but it might take me a bit of time to research it because I was unfamiliar with the specific style of instrument. “Sounds great, really no rush” he said. And so I didn’t rush. I really didn’t rush. Actually, at first I did jump in wholeheartedly, and I began tearing into it, literally tearing the already broken skin off to clean the surface for the new skin. But then I got stuck on a few details. The head appeared to be glued on, with no brackets, hardware, twine or anything to hold it in place. The banjo I had fixed up had hoops and hooks and nuts and bolts. It all made sense to me. But this tiny square banjo from across the ocean seemed to hold it’s skin on by magic. I did a search on the internet “how to attach skin to shamisen” and a whole pile of other similar phrases, but alas I came up empty. I asked around, scanned through journals, but everywhere I looked, I found no information on completing this task, and the shamisen got put on the proverbial back burner. And then life happened, more work came in, I was touring with bands, I moved home and shop a few times. Occasionally I’d run into Roger in town and he’d ask about progress and I’d sheepishly tell him it was still in pieces and on my shelf. I wanted to get it back to him, but not in worse shape than when he gave it to me, so on my shelf it sat, waiting for its day. Well it’s day finally came. 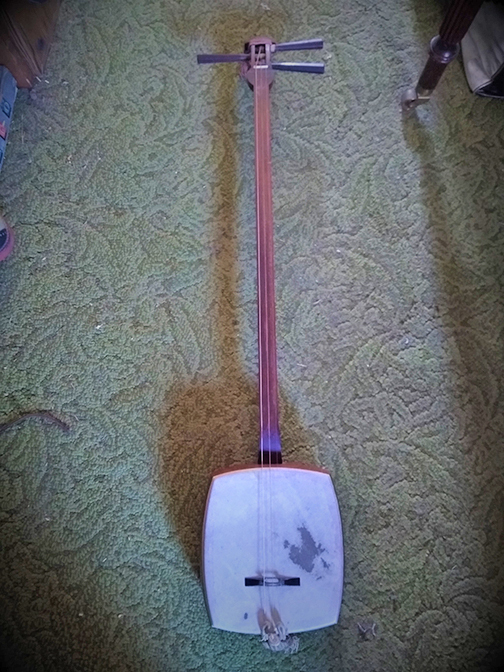 I won’t go into all the details, but between some more diligent research, the massive amount of new info on the internet these days, and just deciding “Dammit, this thing is getting done, and out of my shop!”, the shamisen got completed. Eleven years after Roger first handed me his shamisen, I happily called him up to tell him it was done. Such a ridiculous amount of time had passed, I absolutely was not going to charge him, but he generously insisted on at least taking me out for dinner. We met up and he got reacquainted with his shamisen, and better yet, we got to sit and chat and catch up, and spend more one on one time together than we probably ever had before.